Bradley has been eating more and more table food recently and it's every mother's dream. He's not picky at all and will eat almost everything that crosses his path. I went to dinner with my family the other night and the whole two hours we were there, Bradley ate. And ate. And ate. He was eating bread, strawberries, blueberries, grilled cheese, zucchini, sweet potatoes. Everything. His latest love? Bacon. Rollatini is a fun dish since it makes a cool looking presentation, and is also mouth-watering since the filling (which is usually cheese-based) oozes out of the middle. Whose mouth doesn't water at the sight of oozing cheese? This particular rollatini is filled with a creamy cheddar cheese filing that includes diced pimentos, Bradley's new favorite (bacon), and a little hot sauce for some kick. 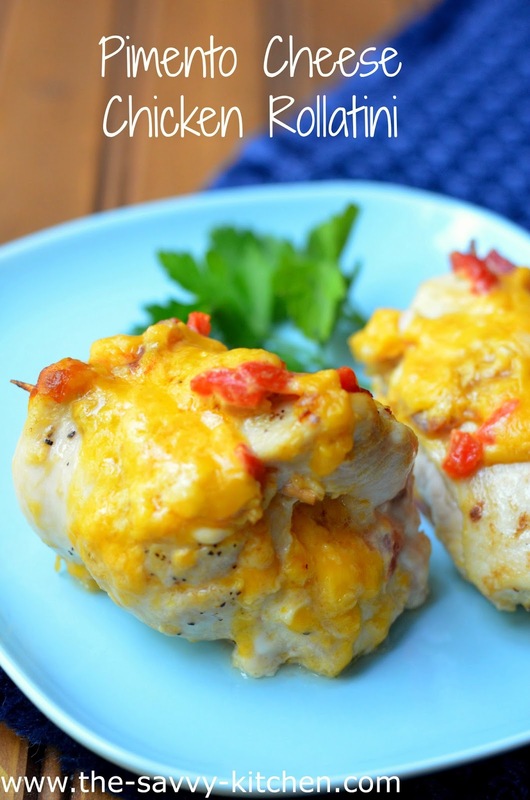 It's also gluten-free, so almost everyone can enjoy this dish! Cook bacon in a large ovenproof skillet until crisp. Remove bacon and place on a paper towel-lined dish to drain. Remove all but one tablespoon of bacon drippings from the pan. In a medium bowl, combine cooked bacon, cheese, scallions, pimentos, mayonnaise, salt and pepper. 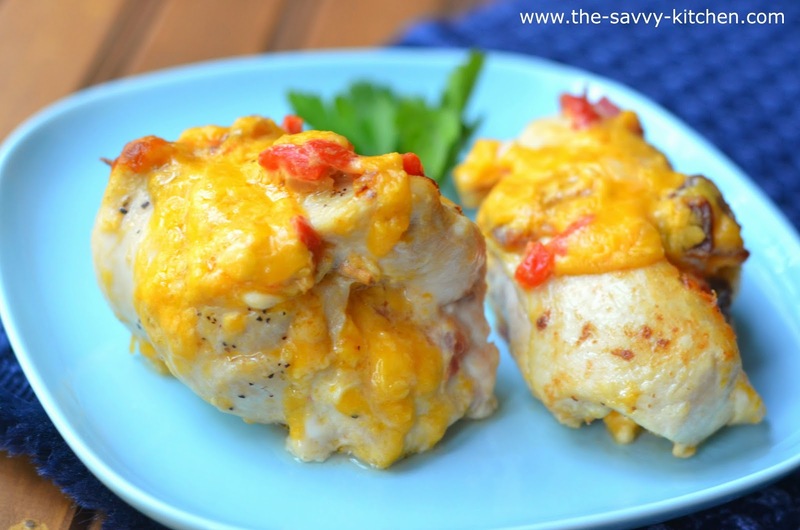 Place 2-3 tablespoons of the cheese mixture onto one end of each chicken breast and roll up tightly. Use toothpicks to secure the end. Sprinkle each chicken breast with additional salt and pepper. Reserve any leftover cheese filling. Heat pan with bacon drippings over medium-high heat. Add canola oil. Add chicken rolls to pan and cook for 3 minutes. Flip over and cook for an additional 3 minutes. Transfer to oven and cook for 15 minutes. 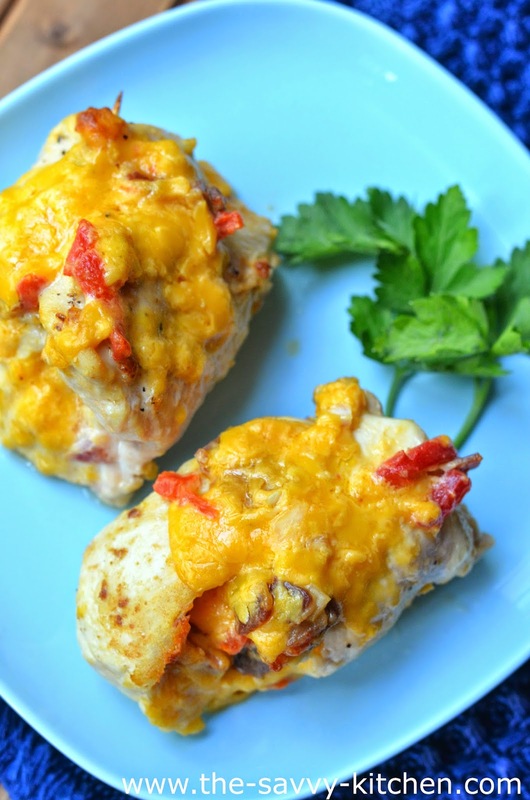 Remove from oven and top each chicken breast with leftover cheese filing. Return to oven and cook for an additional 5 minutes, until cheese is melted and chicken is cooked through.